Mountain Sheep, the iOS developer famous for bringing Bike Baron (among other titles) to the App Store, has launched a brand new game called Beyond Gravity. You can grab Beyond Gravity right now on the App Store for $0.99, which is 50 percent off the app’s usual price of $1.99. Optimized for the iPhone, iPad, and iPod touch, the game is a “procedurally generated 'platformer' where you jump in-between planets and try to collect as many pickups as you can,” according to Mountain Sheep. This gets progressively harder the further you jump. No need to worry tho as you can upgrade your character with loads of upgrades and power-ups! 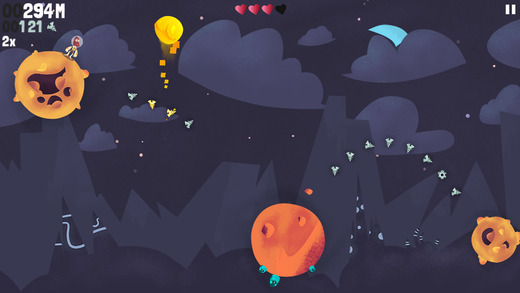 Take control of brave space explorer and hold out as long as you can while collecting missing parts of your spaceship. Never miss to build up crazy score multipliers. As we explained in our previous article on the app, Beyond Gravity looks to be a game that fans of Bike Baron won’t want to miss. For sure, the two titles are different, but Mountain Sheep has promised that both games offer the same “level of polish” and also get “pretty hard” at certain points. Cleverly designed control scheme where all actions in the game are controlled by only one button - the whole screen. Procedurally generated levels ensure non-repetitive and never ending fun. Many goals and upgrades waiting to be unlocked, providing hours of entertainment. Unique, old-cartoon style graphics running at 60fps. Best of all, the game is a premium title “devoid of in-app purchases!” (IAPs), Mountain Sheep adds. You can pick up Beyond Gravity for $0.99 on the App Store, and as mentioned it’s optimized for the iPhone, iPad, and iPod touch. Check back with us later today, because we’ll be going hands-on with Beyond Gravity in a dedicated app review. In the meantime, see: Nickelodeon’s PAW Patrol Rescue Run lets preschoolers save the day in Adventure Bay, Wadjet Eye releases acclaimed Blackwell point-and-click adventure games on iOS, and New in-depth video takes Apple’s CarPlay for a spin.